For many travelers, including us, a Galapagos Islands vacation is a once-in-a-lifetime experience. Here, naturalists have been observing curious animals for nearly two centuries. It was here that Charles Darwin proved evolution. And it is here that visitors travel to experience one of the world’s most remote and remarkable destinations. Yet every visitor to these enchanted islands faces the challenge of picking the best Galapagos itinerary. Staying in a hotel on one of the islands and doing Galapagos day trips to sites on other islands. These Galapagos land tours can save you significant money, but you are much more limited in what you can see (primarily Santa Cruz Island from the Galapagos Islands resorts on the island). Or taking a luxury Galapagos cruise and staying on a live-aboard vessel for a number of days and traveling around to the various islands. This mobility gives you a chance to see the best Galapagos islands and not limit yourself to only one place. Itineraries are tightly controlled by the Ecuadorian government and the Galapagos National Park. The government permits landing parties in certain spots, vessels can only moor for the nights in certain locations and deviations can only be made under exceptional circumstances for safety reasons. The government permits two general Galapagos itineraries, creatively called A & B by most operators (although some call their itineraries Galapagos Islands Northwest and Galapagos Islands Southeast, but the concept is generally the same). Why does any of this matter? The Galapagos Islands are not uniform. 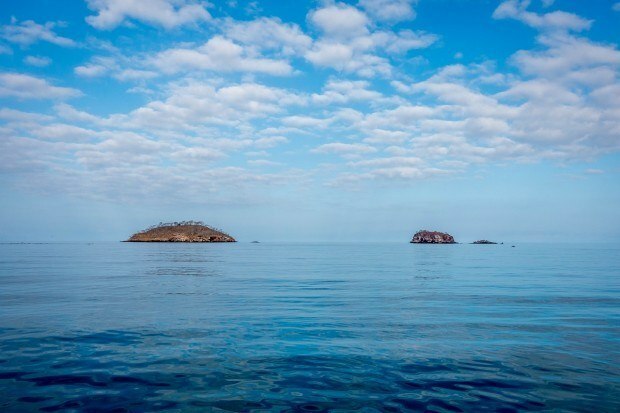 Each island is its own ecology due to the island’s geological formation. 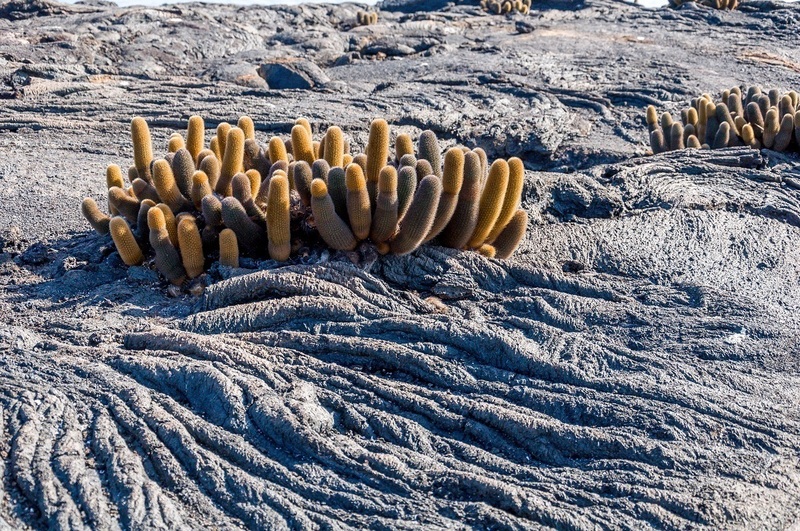 The Galapagos Islands stem from a hot spot deep in the earth. As the Nazca Plate deep in the earth moves towards the South American Plate, thin spots or weak spots in the Nazca Plate allow lava to boil up to the surface. As the plate moves, various weak spots pop through the Nazca Plate resulting in the different islands. 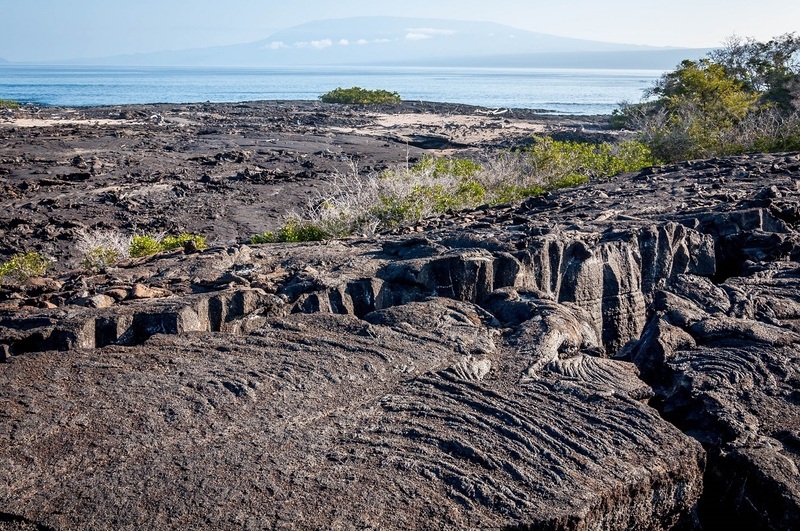 From a geological standpoint, this means the eastern islands of the Galapagos are older than the western islands. And the eastern islands have had more time to develop vegetation. So the islands in the south and east are generally lusher and the islands in the north and west are rockier. If you have two full weeks, most boats make both itineraries on alternating weeks, so you can see nearly all the islands. However, most visitors are only able to spend one full week for their Galapagos trip, so they need to choose between the two itineraries. Baltra Island – This is the location of a small harbor and the Galapagos international airport (while there is another airport in the islands, most flights to Galapagos land here). It is a former military base and some of the old base can still be seen. 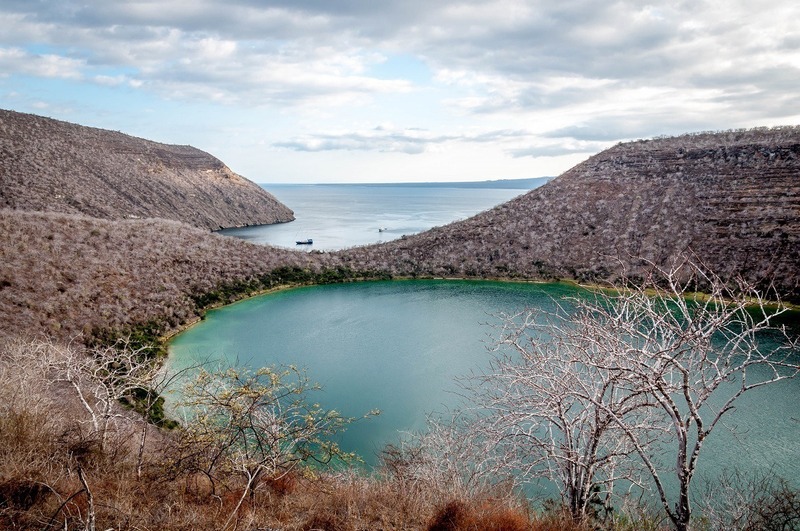 Santa Cruz Island – This is the main island of the Galapagos, home to the town of Puerto Ayora and also the Charles Darwin Research Station and the forest highlands. Floreana Island – Common sites to visit are Punta Cormorant, the Post Office Bay and the Devil’s Crown. Espanola Island – Sites of Gardner Bay and Punta Suarez. San Cristobal – This island has a large number of sites, including Puerto Baquerizo Moreno, the San Cristobal Interpretation Center, Punta Pitt, and the stunning Leon Dormido rock. Santa Fe – Some itineraries can also include the small Santa Fe Island. Baltra Island – This is the location of a small harbor and the Galapagos airport. It is a former military base and some of the old base can still be seen. Genovesa Island – Genovesa (or Tower Island) is a rocky volcanic caldera that is actually due north of Santa Cruz and home to Darwin Bay and the Prince Phillips Steps. Santiago Island – The stop here usually take in vast James Bay. Isabela Island – This is the largest island in the Galapagos and most western Galapagos itineraries feature many stops, including Elizabeth Bay, Punta Vicente Roca, Urbina Bay, Tagus Cove and the massive Sierra Negra volcano caldera. This is our vote for the best island in the Galapagos. 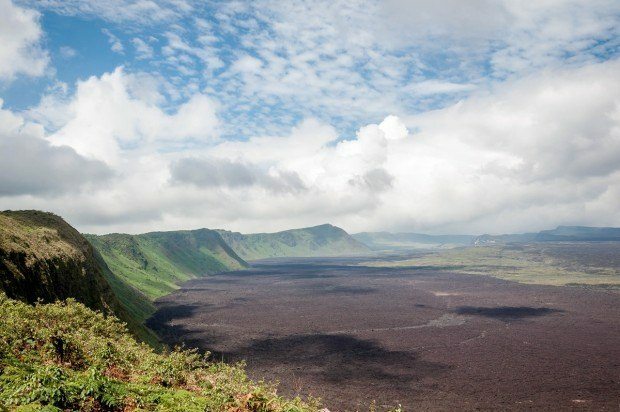 Fernandina Island – This is a chance to see the lava fields of Puna Espinoza. The lava flow at Punta Espinoza on Fernandina Island. 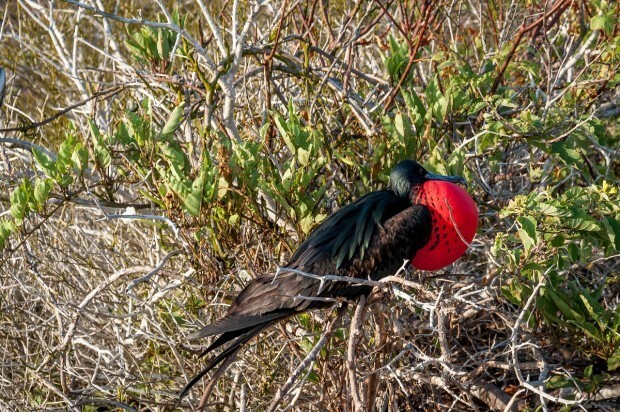 Which Galapagos Itinerary is Best? Ideally, visitors would take in two full weeks and do both itineraries. However, for many travelers, that’s not realistic. And it wasn’t possible for us. We only had two weeks for this trip – one week on the mainland of Ecuador exploring the mountains and one week in the islands of the Galapagos (however, the different climates presented some packing challenges, so be sure to check What to Pack For Ecuador and the Galapagos). For us, we wanted to see the other-worldly lava landscapes so we chose the western Galapagos trip. However, there’s really no bad choice! The best Galapagos cruise itinerary is the one that takes your interests into account. 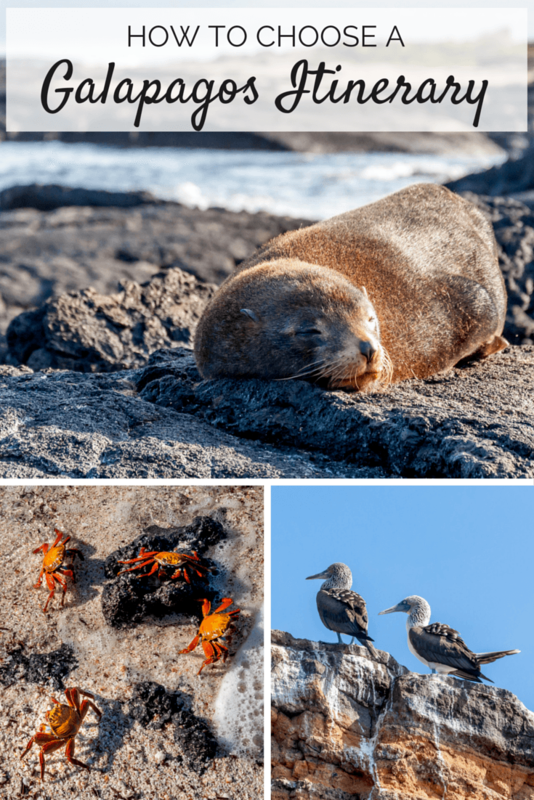 If you don’t have two weeks to visit all of the islands and your trying to prioritize your Galapagos Island vacation, here are some things to consider. No since one week itinerary will hit all of the hightlights. You will have to make some choices. For us the best Galapagos Islands are historic Floreana Island (home of Post Office Bay) and San Cristobal Island with its numerous sites and the incredibly beautiful Leon Dormido rock formation. These are included on the Galapagos Itinerary A (or the southeast). 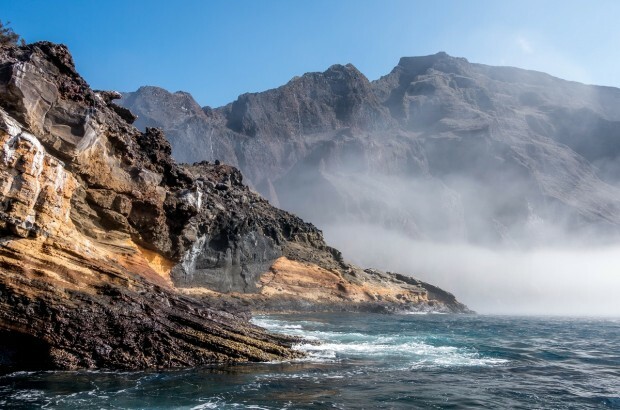 From the Galapagos Itinerary B (or the northwest), the best islands are Genovesa Island or Tower Island, with its rocky caldera and the chance to snorkel with dolphins in the wild. Also a highlight are the rocky lava fields of Fernandina Island and the numerous sites of Isabela Island (including Punta Vicente Roca with its cave and snorkeling with turtles). 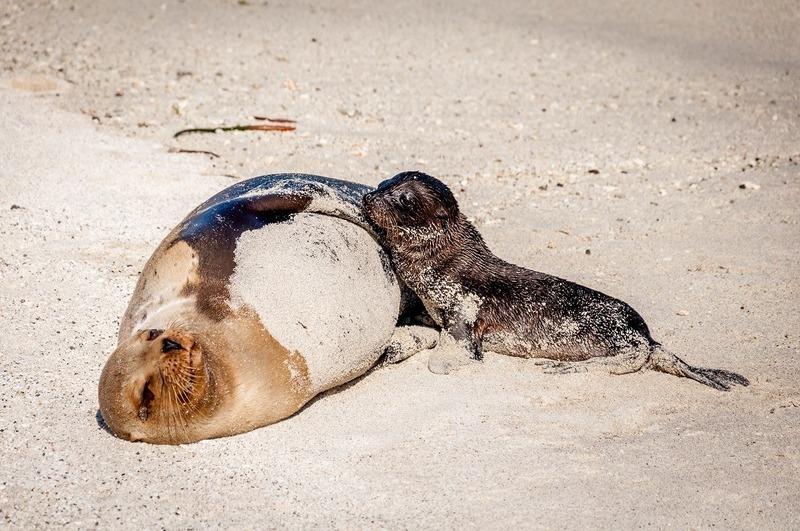 If you can’t tell, we’re slightly biased to this Galapagos Islands tour option. And both itineraries include the chance to what life is like for the people of Ecuador in Puerto Ayora on Santa Cruz Island. There is really no bad time for your Galapagos tour, but it does come down to what you really want to see. 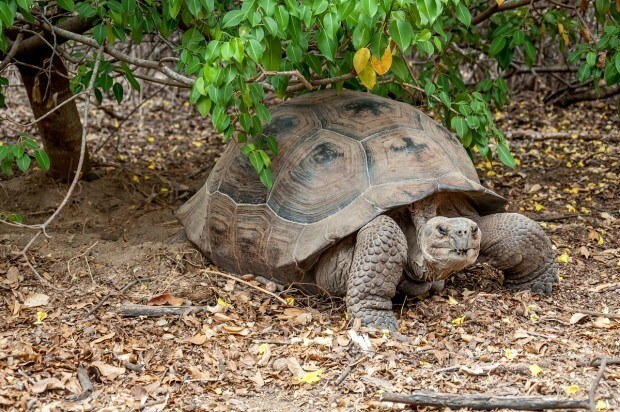 There are only two seasons in the Galapagos Islands: cool and dry (generally early-June through November) and warm and wet (generally early-December through late-May). Each season has its benefits. The cooler and drier season last from early-June through the month of November. During this time, nutrient rich waters bring an abundant of marine life close to the islands. If you’re a scuba diver, this is prime Galapagos diving season. On land, the birds are aggressively hunting fish in the water and getting ready for baby season. The downside here is that the seas can be quite a bit rougher. If you are planning a cruise in the Galapagos and have motion sickness, you may have some problems. Many of the best Galapagos tours focus on the spring: the warm, wet season. This generally lasts from early-December through late-May). During this time, there’s a daily rain drizzle that springs the islands with water. We should note that we were in the Galapagos in March and only experienced this about half the time. The warm and wet season brings with it babies…when you can find them. Green sea turtles lay their eggs in December and January and you’ll find lots of evidence of turtle nests on the beaches. The downside to the warm and wet season is that it can sometimes be hot – really hot. The Galapagos Islands sit at the Equator, so the sun can be really intense. This isn’t tanning at the beach sun. It is cover yourself or burn to a crisp sun. 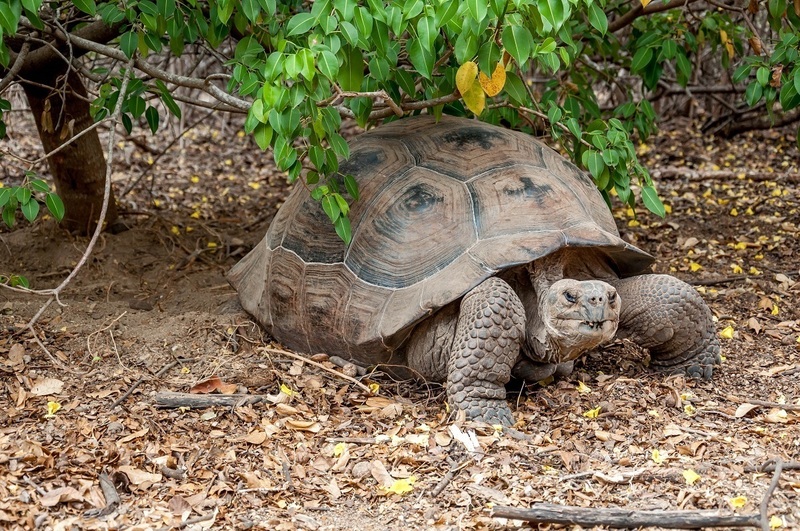 What do you think about Choosing the Best Galapagos Itinerary? Hey – wow… awesome photos! We just got back from a trip to the Galapagos and did a 5 day catamaran tour that pretty much followed the “A” itinerary you mentioned. It was pretty awesome and I’m all for the live on boat experience. Pretty sure our trip would have suffered with day trips alone and we wouldn’t have been able to see nearly as much. I’m starting to plan a Galapagos trip for probably 2017 but didn’t know there were two different itineraries for the islands so this is super helpful. I guess I’ll just need to set aside at least 2 weeks so I can do both! The Galapagos is one of my dream destinations so I want to explore as much as possible. Samantha, if time is no limit, do it. Regrettably, we only had one week in the Islands. That meant we missed Post Office Bay and some of the other sites that we’d read about. I guess it just means we’ll have to back again!